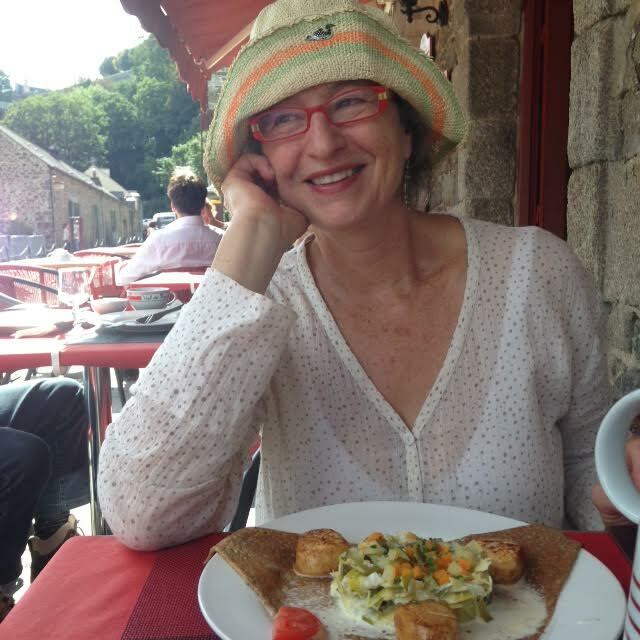 My friend, Montserrat and I walked, climbed, and strolled the cobblestoned streets, exploring Dinan (and Mont St. Michel), when we weren’t busy eating. Which we were, a lot. Our last afternoon in Dinan we got into an animated conversation with two French couples sitting next to us at the Crepe Restaurant, where we, Montsie and I, shared a leek and scallop crepe and a salmon with creme fraiche crepe. (I digress. I always digress for food). admiring Montserrat’s excellent French. Montsie, after all, lived in Paris from ages 10 to 18. There’s no comparison between Montsie’s and my French. But M ontsie and I, we both have stories to tell, and besides telling some to the lovely French couples that afternoon, we had some long slow mornings in our apartment kitchen telling quite a lot to each other. Eating bread and cheese and me sipping tea, and Montsie, coffee. We talked about living in North Beach, me in ’69-70, Montsie, in ’75. I recalled the Cafe Trieste and a friend of mine, David Goldstein, a smashingly attractive and brilliant storyteller. He and his wife had married young, lived in Morocco for a year or two before moving to San Francisco, and had that air of bon-vivant-quasi-leftist-in-a–privileged-sort-of-way-young-and-free-self-confidence. Their apartment was filled with furniture they had picked up in Casablanca, or was it Marrakech? One sunny day, (when I was 22, he, 24) David mentioned he had a pilot’s license and did I want to go for an airplane ride? What a lark! I thought. As the plane’s wheels left the runway, he suggested I keep an eye peeled for jets taking off from SFO so we didn’t get in their jet stream, or tail wind, whatever you call it, and crash. Zut alors! I thought, we’re in big trouble! After we cleared SFO, my stark fear was somewhat mitigated by the beauty of our aerial view of San Francisco, Marin, Napa, and the East Bay, but descending over the Bay toward the airport were more moments of terror. David could tell a story like nobody’s business, but could he land a plane? We hovered perilously. I was never so happy in my life as when those wheels met solid ground and slowly rolled to a stop. Those mornings in Dinan were almost like being at the Trieste. Only better. Montsie and I have both lived full lives. We have stories. Our Dinan kitchen was the perfect place to unwind a few. Because being in France is an inner journey as surely as it is an outer one. Being one’s own Anais Nin, Andre Gide, Proust, Les autres. 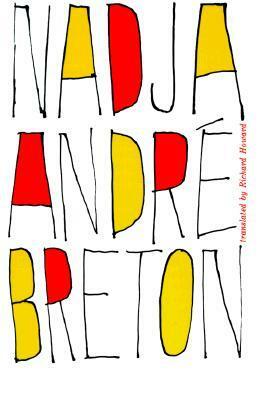 David once gave me a present, a book by Andre Breton called “Nadja”. I reminded him of Nadja, he said. I felt flattered until I read the book and discovered Nadja’s main attributes — looking exotic and mysteriousness. She was the kind of woman men could easily project their own fantasies onto because she, like me, rarely spoke, thus giving rise to all manner of possibility. My feeling flattered quickly turned to profound discomfort as I realized that this was how David (and other people) saw, and related to me. 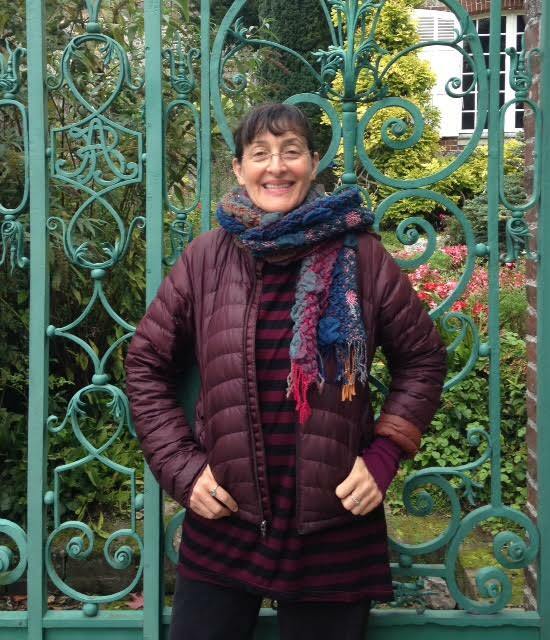 A year later, I was Pilar, aka Alice B. Toklas to one female writer/roommate. I’m grateful to David for handing me a mirror. It was a turning point. It took me a long time to leave my Nadja self behind. If I hadn’t, I wouldn’t be writing any of this, and you (and I) would be guessing at who it is behind this face. Life is far too amazing to stay in fuzzy relationship to it, waiting for someone else to interpret, judge, value or de-value one’s experiences and worth. Here in Bretagne and Normandie, my young woman self has apparently decided to come along for the ride, reminding me how things used to be, and grateful to me for having persisted in finding her voice. I always knew she had one; she just didn’t know how to find it for an awfully long time. In Dinan and Veules kitchens, I tell her story. She approves. Then together we go out to experience the world with our self-same eyes. Brava Julie & Amy, and all of us going for the gold of self-knowledge, kindness, compassion and joy! Not judging! Doing! Here’s er’s take on the same idea. I so agree! The special experience of traveling with our younger selves is a particular joy and privilege of the older traveler. Coincidentally, my recent trip to Chicago provides a perfect example. I stayed with a friend I’ve known since high school. I love to stay with her because, having “known each other when. . .”, we help each other remember who we were and deepen our understanding of who we are now. . . and, of course, who is emerging as the inexorably older self. We have great conversations. We “talk about ideas.” We try not to judge. We support and continue doing what we can. And here’s another little story from that week, a moment of meeting the past: My partner Jim and I had a chance to drive past my childhood home in the suburbs. Spontaneously we decided to turn off the (now) busy highway into “my” driveway. There, hidden from the highway by overgrown bushes, was a young woman. She was hitting a hockey puck into a net on the lawn, the same lawn I used to mow as one of my weekly chores. Her father emerged from the house inquiring somewhat suspiciously in Russian-accented English who we were and what did we want. Not at all unlike what my own Germanic father would have done 60 years earlier. I started to explain how good it felt to see the house well-cared for. And the memories! what it meant to know they’d been preserved (not torn down and replaced by one or two McMansions, a popular trend in the area.) But that particular connection was not to be. The girl was obviously too young to be interested. And perhaps even the father’s curt response was due to his not being old enough (yet) to undertand. Perhaps if an elderly grandmother had emerged from my childhood home to listen to my story, perhaps we could have appreciated together the experience of traveling to a place where we meet the younger self. I don’t have anything to add but am really enjoying your insights into your travel. Much love – keep on writing – keep on doing. Next Next post: Perfect. Not perfect.